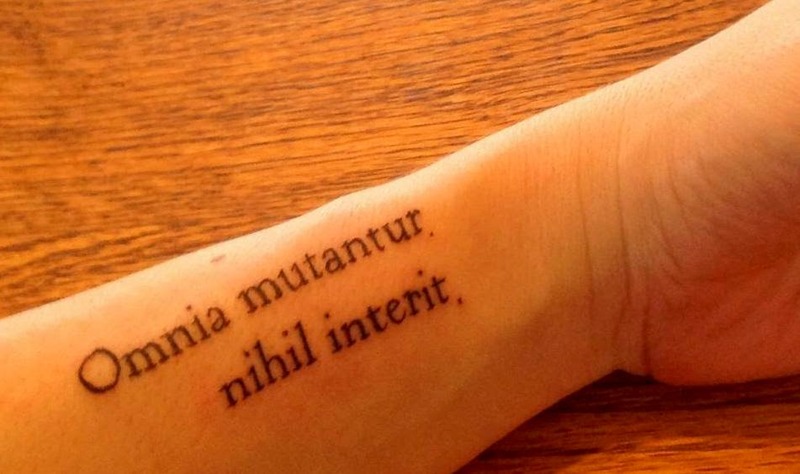 So many European medievalists and early modernists have Latin tattoos that I’m now declaring that this is A Thing. (I know: I’m probably the last to notice!) First, we have the example of the late, great (in bloggy terms) Squadratomagico, whose tattoo is on the back of her neck & which I have met in person (scholar, neck, tattoo, and all.) Then when I got to the Huntington, I noticed that a medievalist here has a mid-thirteenth century quotation from a manuscript tattooed on the inside of his left forearm. I asked my tattooed Huntington colleague if he thought so many of his medievalist colleages had tattoos because medieval scholars in particular are accustomed to ink on skin through their work on vellum documents and manuscripts. (Vellum is a fine parchment made from lamb or kid skins, and is among the oldest paper-like technology we have for recording and preserving information.) He agreed that this might be an interesting connection, and also said that it’s pretty popular for people to get textual tattoos these days anyway. He also connected his tattoo to a major life change–in his experience, winning tenure, whereas for Flavia it was her fortieth birthday. I’ve never wanted a tattoo, mostly because I’ve always been aware how quickly fashions change and am becoming more aware (sadly!) how skin can sag. I am very glad I never got a tattoo when people of my generation (in the early 1990s) started getting inked. Also, perhaps even more importantly: they’re really painful, and I’m a huge pain baby, so there was no way I was going to volunteer for something that hurt! But most adults these days seem to be inked–I felt conspicuous a few years ago when we went to Hawai’i and my husband and I were among the only people over the age of 18 who didn’t have visible tattoos. I haven’t noticed a trend among early Americanists for acquiring body art, although of course early modern sailors and merchant mariners were tattooed for various reasons. Simon Newman wrote about seamen’s tats more than a decade ago in a really good article and then a book, so there are some ways in which early Atlanticists could link their scholarship directly to their bodies. This is all great, including the Zimmer book, which I just bought. I teach a course on body modification (I’m an anthropologist) and I’ll drop in some of this–possibly even links to the site if no one minds. I always wanted a teeny tiny Mondrian tattoo on an inner thigh but was both too cheap and too chicken. My friend J.K., who is in his mid-forties, objects to the tendency of young people to have lots of tattoos. In his opinion, the only purpose of tattoos, a purpose sanctioned by tradition, is to record and reflect experience, and it takes time to accumulate that experience. Flavia should be admired for her concision: one four-word tattoo every forty years. Maybe when I turned fifty, I should have gotten a five-word Latin tattoo: “mens sana in corpore sano.” Missed the chance, though. For several years now I’ve used Simon Newman’s article on tattooed sailors as an alternative essay question option in our ever-popular required course “U.S. History for Political Prisoners” (i.e. students driven into a survey course by the curricular bayonet to keep the department’s “seat” numbers at dean-acceptable levels). Students like it (not the bayonet pricks, the question on tattoos), and probably wonder what this old guy up there going on about whatever even knows about tattoos. It skews male, to a certain degree, in competition with the other alternative, Thomas Dublin’s piece on New England Mill Girls, which they also like, and which skews even more definitively female. Asking students to speculate out loud in class before the exam begins about whether there might ever have been any “tattooed Mill Girls” (as a way of suggesting that until you ask weird but actionable questions, you will never know about anything) brings only clouds of existential silence. Tatoos were really class-proscribe when I might have even considered one, but I’m a pain baby too. Count me among the list of medievalists with tattoos: most relevant to this discussion is the opening of “Dream of the Rood” (in Old English), on my inner left forearm. It’s the poem that led me into the study of Anglo-Saxon theology, so it fits. Like you, I never, ever, had the least interest in getting a tattoo (though I know many people with lovely, interesting ones) — until the idea came to me out of the blue and fully formed a little over a year ago, and in a way that actually almost no ideas in my life have ever come to me. (When I told my spouse about it that day, he thought I was having a weird reaction to the flu vaccine.) Call it a vision! Still, I’m pretty sure that in 20 years or less tattoos will be terminally uncool (if my having one isn’t already proof of their uncoolness), because they’ll be what everyone’s MOM and DAD have — and who wants that?? Thanks for all of your comments–esp. the new commenters, Ruviana (your name seems familiar, though–not new?) and James. (At least you’re infrequent commenters here.) Love the suggestion for the Zimmer book–can’t wait to see it! And Ruviana: please encourage your students to read & leave more comments, if they want to. The more, the merrier. Well, I have several tattoos and anticipate more–they are part of an evolving work that will require a lifetime to complete. Definitely not a “fashion” choice. I am in the minority wrt ink, both in terms of my academic discipline and geographic location, even though I live in a place with a deep tradition of such expression. I think this is conservative colonialism, a class issue. I’m at a large university that ranks in the top few percent globally and I’m the only person I know with ink as visible as my own. As to the “pain,” it is not so bad. The needle surely hurts (some places more than others) but you get a nice high from the endorphines. I once had some jagua (black, temporary) work done on my hands and arms before a lecture. The art was beautiful but at a distance was something like gauntlets. I expected the event to be confrontational (it was) and that was part of being mentally tough for it. Funny: everyone has asked me about the pain (and even the artist I saw was eager to assure me that it wouldn’t be that bad) — but I literally never considered whether it might hurt. I had other anxieties (about mistakes, misspellings, hating it), but never about pain. I would not say that it hurt — minor discomfort is more like it — but my tattoo is small and simple, not in the most sensitive of areas, and only took about 20-30 min. ; an hour or two of work might have been another matter. I’d say it’s broadly comparable to professional leg (etc.) waxing, which I had a lot of experience with in my 20s: not exactly a sensation you’d seek out, but not grueling or even much worth remarking on later. My medieval tattoo isn’t textual; it’s a Byzantine eagle, on my back (with the top poking out if I’m in a tshirt). It was to celebrate passing my comps, which was easily the most traumatic thing that’s ever happened to me. I now have several tattoos and am thinking of getting more. They all commemorate life experiences and transitions. In addition to the magic square, I have a small animal on my right shoulder, budding out of some foliage like a flower. It is based on a thirteenth-century manuscript, but is not a literal rendering ~ my artist wanted to put her mark on the look of it. That one I got when I turned 50, and it signifies my hopes for the second half of my life. I wanted a large back tattoo for some time, and finally got one based on a Japanese watercolor about 2 years ago. That one commemorates a major shift in my life: some folks here who remember my old blog may recall that I was married. Well, not anymore. I got that tattoo when I realized things were falling apart beyond repair. I have another planned for this summer, when my book goes to the press. I don’t find tattooing painful for the most part. Once in a while, the needle will hit a spot that seems to be particularly sensitive, but the general sensation is of being scratched or scraped, slowly but hard, with a fingernail. Much less painful than a cat scratch or a million other experiences you’ve already had in life. I suspect when tattoos were more clearly gendered male, some guys began to see them as a mark of machismo and to exaggerate how painful they are. Anyone who has one will tell you that they really are not, unless they are directly atop bone. You wouldn’t want to tattoo your elbow. Muscle or fat is only minor discomfort. My students who choose to write about Simon Newman’s article seem drawn to the point of being fixated on his claim that 18th century shipboard materials for tattooing included things like “urine and gunpowder,” and their comments about pain issues run the gamut around that datum. Regarding EnglishLitProf’s point above about the slow accumulation of “experience” and its meaning, they have a real tendency (in the context of sometimes being disconcertingly specific about what and where their body marks are–not requested by the question) to attribute them to specific experiences. I’ve wondered about that. At an early enough age, as a baseball philosopher once awkwardly expressed it, maybe “it gets late early out there,” experientially. Is there anything one can’t do with urine and gunpowder? I think they’re two of the most useful chemicals in the eighteenth century. I’ve wanted to get some tats for a long time, but PhysioWife is dead set against it. Battles, choosing: not this one. I really like the old-school nautical ones, like a ship anchor. A ship’s anchor with a Caduceus wrapped around it? Or a heart with the word MOM in it? Gengenbach, Heidi. “Boundaries of Beauty: Tattooed Secrets of Women’s History in Magude District, Southern Mozambique.” Journal of Women’s History 14, no. 4 (Winter 2003): 106-41.